America's 242nd birthday is next week and we're celebrating outdoors! Joining The Revolution with Jim and Trav to kick off the 4th of July in outdoor style will be Taylor Drury of Critical Mass, plus Pigman from Pigman: the Series, Ranch Hand's Jerry Courtney and Josh Atkinson of Blitz TV. 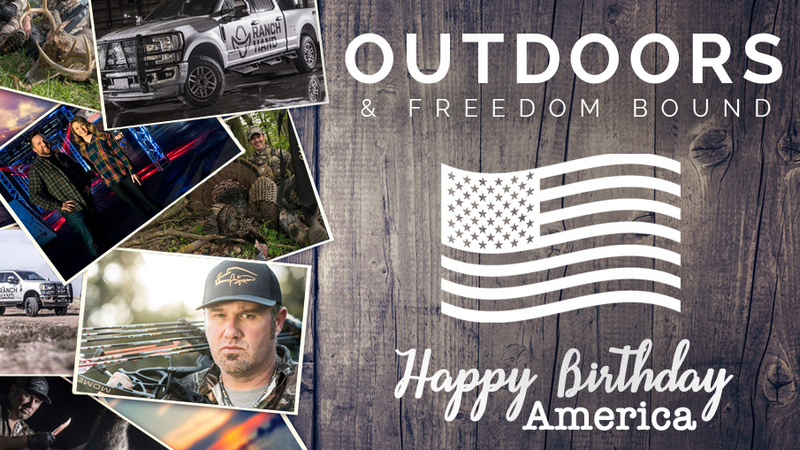 We're Outdoors & Freedom Bound this week and presented by Outdoor Channel, Sportsman Channel, World Fishing Network and MyOutdoorTV. Hold on to your seats y’all, we’re going to have some fun! Brian “Pigman” Quaca, host of Pigman: The Series on Sportsman Channel, is here this week to talk handgun hunting, busting bacon and the secrets to his success in this special two-part interview. He’ll kick things off with firepower. Pigman tells Jim and Trav that there is a big difference between hunting with 10mm pistols, that may or may not be able to take out a pig, and the hand cannons he’s hunting with this season from the Smith & Wesson Performance Center. In particular he’ll discuss the 460 S&W and the 500 S&W and their capacity to take down whatever you’re shooting at. Pigman says that shooting with these large caliber handguns has taught him a lot about trigger pull and says that if you don’t pull the trigger cleanly, you’ll see the outcome of that mistake in your shot. While some hunters can proficiently shoot game at longer distances with pistols, Pigman says that most handgun hunters shoot much shorter distances and that’s where optics like the DeltaPoint Pro from Leupold really shine. While there are plenty of great handgun scopes out there, Pigman tells Jim and Trav that for inexperienced hunters, these scopes can complicate matters. The DeltaPoint Pro red dot sight is simple to use and although you don’t get magnification, when tested side by side with a scoped pistol, he tells Jim and Trav that you can still shoot just as tight of groups. Plus, you get the added benefit of a smaller, more compact and lighter weight optic to top these already heavy and big recoiling handguns. Now, it’s time to put all that advice from Pigman to use and go out and bust some hogs. But, how do you hunt pigs on these hot summer days? Pigman tells Jim and Trav that the hogs rarely move in the morning and instead wait until the last 5 minutes of light and through the first hour of dark to travel. Because they are more nocturnal right now, Pigman will talk about the use of thermals and quality optics in order to be successful, plus the importance of playing the wind to avoid those highly scent-sensitive snouts. When it comes to hunting, he tells Jim and Trav that everyone hunts hogs a little differently and there are endless ways to kill pigs. However, he has dialed in on his own key to success which he says is Covert Scouting Cameras. Each time the camera snaps a photo that picture is then sent directly to his phone. Pigman says that information is tremendously helpful and allows him to see when and where the hogs are which makes his hunts much more productive and successful. While trail cameras like these may drain batteries a little quicker and also have a data plan you have to pay for, Pigman says they save him money in the long run and provide him with opportunities that he wouldn’t otherwise know existed if he didn’t get current photos. Tune in for an always fun and informative interview this week with Pigman and make sure to catch him weekly on Pigman: The Series airing on Sportsman Channel. If you are a follower of the outdoors and hunting related television shows, then you know who the Drury's are. The Drury’s have created shows like THIRTEEN, Dream Season, King of the Spring, Bow Madness and now they have something new up their sleeve! Tune in as Taylor Drury joins The Revolution to talk about their brand new reality hunting show, Critical Mass, that she’ll be co-hosting alongside Matt Drury. Critical Mass will premiere July 3rd on Outdoor Channel and will showcase 12 contestants from across the country as one new defender and one new challenger battle it out each week with the goal of reaching Critical Mass. Contestants will face off in a series of archery course challenges, in addition to showcasing their hunting seasons. The fate of the contestants won't be left up to a pro-panel or the hosts, but rather the contestants themselves who will have to judge each other. Taylor will explain the competition and also highlight an important element of the show which happens to be an extreme archery course. Taylor tells Jim and Trav that this new show is a departure from the hunting shows you're used to seeing. They wanted to create something new and fresh – something that would take hunting back to the basics and celebrate why we hunt and why we live this outdoor lifestyle. They're also hoping this new concept is engaging for not only hunters, but for those who have never hunted before. Taylor says that they want to be able to intrigue newcomers, get them excited about the lifestyle and encourage them to give hunting a try. Tune in for a fun talk with Taylor Drury and don't miss the premiere of Critical Mass on Outdoor Channel. Be sure to follow the Drury's on social media for sneak peeks and teasers leading up to the show premiere! There are some 6 million vehicular accidents in the U.S. each year which translates to 15,000+ accidents each day. Those statistics should be enough to make everyone want to consider extra safety precautions for their vehicles. Wildlife and off-road debris happen to be something that I encounter often and want protection from, and I know many of you feel the same way based on the comments you've left us previously talking about your experiences with hitting deer, cows and other wildlife. While protection from these wildlife elements is important, Ranch Hand products also put an extra layer of security between your vehicle, its occupants and other drivers, while you're traveling on the pavement. Jerry Courtney, VP of Marketing for Ranch Hand, joins us this week for an in-depth look at the safety Ranch Hand grille guards, front bumpers and back bumpers provide. There may be a misconception that grille guards and bumpers are just for off-roaders and those that like to get a little mud on the tires. However, that assumption is off base. Grille guards and bumpers aren't just for people who live in rural areas, they aren't just for farmers and ranchers and they aren't just applicable for outdoor lovers like myself. Daily drivers, dwellers of the concrete jungle, navigators of busy freeways, those that may never venture off the pavement - this group of drivers can also benefit from the installation of Ranch Hand accessories. Jerry illustrates the important safety role a Ranch Hand bumper can have for a daily driver as he talks about their Impact Tour – a traveling trailer exhibit with a 3/4-ton Chevy that was involved in a significant accident. Jerry will describe the dramatic crash that led to the driver, Seth Spiker, plummeting off of a 40-foot overpass ramp after losing a tire where he ultimately landed on his Ranch Hand bumper and amazingly, walked away with only minor scrapes in an accident that could have had a far worse outcome. Jerry will also highlight upcoming dates for the Impact Tour so people can go see this exhibit in person and even get the chance to meet and talk to the driver of the truck that is featured. Josh Atkinson is the co-host of Blitz TV on Sportsman Channel and a passionate hunter. He'll join The Revolution this week to talk deer hunting and all the prep work involved in order to create productive food plots and habitats. Josh tells Jim and Trav that where he lives, food plots are certainly an attractant, however he doesn't hunt deer over them. Instead, he says that his main goal is to instead draw deer to the food plot and intercept them along the way. While healthy and attractive food plots are important for drawing deer into an area, having the right bedding and cover available is also crucial for keeping them there. Josh tells Jim and Trav that he likes to put his stand between the bedding area and food plot, however when doing that, he cautions that you really have to be mindful of access issues and wind direction. Finally, Josh will talk about Blitz TV which is set to begin airing on Sportsman Channel in July. The show highlights the real lives, real families and real jobs of Josh and co-host Trent Cole and how these hunters strike a balance between their everyday lives and their hunting passions.